The National Weather Service has been closing eyeing a storm next week that could bring anything from rain to snow to nada. For the snowstorm-starved (obsessed? ), this represents the first "interesting" set up of the season. THIS IS ONCE AGAIN CLOSE TO THE SAME WINTER STORM THAT BROUGHT HEAVY SNOWFALL TO EC MN ON HALLOWEEN 1991. THE MAIN DIFFERENCE WITH THE 1991 STORM IS A MUCH COOLER THERMAL PROFILE ACROSS THE UPPER MIDWEST. TROPOSPHERIC LEVELS OF THE ATMOSPHERE. AGAIN...THIS SYSTEM NEEDS TO BE WATCHED VERY CLOSELY ON ALL TYPES OF HAZARDOUS WX. Professional meteorologists and weather enthusiasts, alike, please share your thoughts. A large trough of low pressure in the upper levels of the atmosphere is expected to form over the Pacific Northwest this weekend. That large ripple in the jet stream is supposed to slide eastward from there, producing rain and snow along the way. Our computer models are all still creating separate solutions. One is dropping the storm deep into the southwestern corner of the country, which basically misses most of the Upper Midwest. Another just brushes Minnesota with rain showers late Monday, possibly mixing with a little snow on Tuesday. 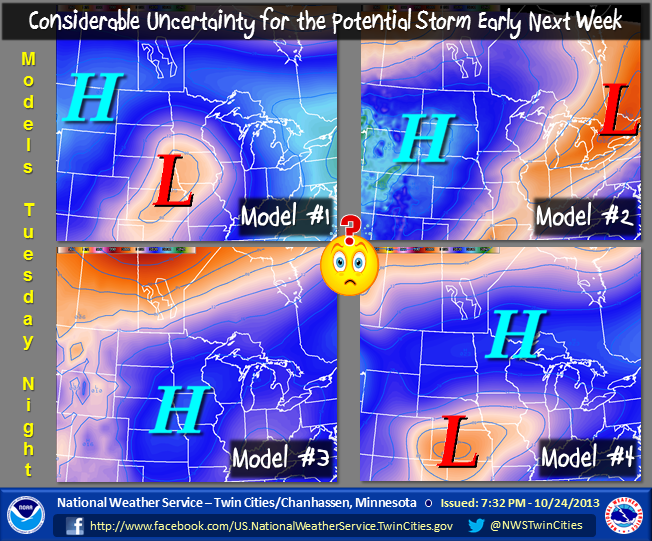 There is very little uncertainty that a storm of some strength will traverse the upper Midwest Wednesday. The low *will* form over the west coast and quickly move along given the strong upstream ridging. It does not seem likely that the storm will be hooking as much as 1991...the only real comparison between the two is the calendar. I think drawing that comparison is a little much simply because water will fall out of the sky near Halloween. Halloween of 91? wow I hope I don't get to experience that. I have to admit I didn't recognize that analogue. model #1 looks like the Canadian GEM, Model #3 looks like the Euro, Model #2 is the GFS. What model is #4? Environment Canada has the equivalent of small craft advisories out attm because of system #1. but with a first look at some of the 12Z models, I could maybe see them up that to a gale warning. But I'm surprised EC doesn't have at least a special weather statement out for Chapleau, Algoma, Superior East, Superior North, Greater Sudbury, North Bay, Timmins, and Earlton for potentially 5-10 cms of wet snow away from the lakes and maybe waterspouts near Lakes Superior/Huron as well as Georgian Bay and the North Channel near Manitoulin. Way too early to get excited about a major Winter Storm over the Upper Midwest. There appears no doubt that a large trough will slowly migrate east across the central sections of the country, but it is foolish to predict how energy will interact with this trough so early in the game. If this storm slowly pulls out of the SW U.S. & digs deep, then it will be too warm for snow so. MN since warm air will have a better opportunity to wrap into the system from the Gulf. Best case scenario for snow lovers is for this storm to quickly come out as one solid piece of energy between MON-WED. However, gut feeling is that this will not happen & that the bulk of the energy will hang back in the desert SW before slowly into the Plains later next week. With that being said, 50s & 60s with fog/rain would be a more appropriate scenario. Who writes the discussions at the NWS? I find their spelling, grammar, and readability sorely lacking. These attributes are important in weather forecasts. THE MAIN DIFFERENCE WITH THE 1991 STORM IS A MUCH COOLER THERMAL PROFILE ACROSS THE UPPER MIDWEST. Does that mean 1991 was cooler or next week is cooler? I'm guessing they meant "WAS" instead of "IS"
Either way, the Euro is predicting a high of 63 for Halloween. Bring THAT. Proper grammar is difficult when you have to use all caps and can't use a comma. The topic of writing quality in the NWS discussions is something I've always wanted to discuss. First, in this day and age, why can't they have a system that allows them to go without ALL CAPS (the shouting.....) and, more importantly, commas? Communication is so important. Beyond those limitations, I've seen some instances of decent writing, but a fair amount of poor writing. I suppose it's not surprising since mets are scientists more than writers, but I still think there should be some quality control in the form of proofing, etc. Wet storm...way too warm. I'm still a little perplexed on why the NWS jumped all over this storm and hyped snow so early in the game. Without looking closely at the maps/details, from a sheer comparative perspective, no other outlets talked up the possibilities of this "event" like the NWS, whom many of us think of as being more on the conservative side. There's at least one "Halloween 1991" comparison (threat?) every season isn't there? Just came early this year. And even though the NWS wasn't forecasting another Halloween '91 blizzard, just mentioning it is a little sensational isn't it? The average person seeing that dreaded phrase can't help but think "decent snow"...at least. It goes back to the old teletype days. The NWS office in Tallahassee uses lower case letters and punctuation. Why the rest of the NWS hasn't followed, I'm not sure. First measurable snow of the season for the metro late tonight/tommorrow morning?......nothing to write home about but a half inch to inch is possible, enough to muck up the morning commute. Both the ECMWF and GFS are in agreement for a potentially major winter storm next week wednesday. If current trends were to hold, the storm would give us a good shot of snow. The ECMWF is warmer with the system, and brings the snow line very close to the metro. The GFS puts the heaviest bands to the south of here. The medium range model (DGEX or Extended NAM) places the band well to the south, giving Madison the bulk of the snow. It will be interesting to watch how things progress. boy that Halloween blizzard really nailed us last night, and that heavy rain instead of snow we got really added up. NWS may want to scale back the full disclosure piece next time they go throwing out Halloween Blizzard discussions. 12z Model run of GFS looks favorable... hopefully the trend holds. Bill....new weather story graphic at the NWS website.....their talking accumulations close to home for Tuesday night/Wednesday, fyi. Thanks @bigdaddy. I'm out of town until Monday eve. Will try to post a new thread when back. NWS going with 2-4 inches as of right now for Tuesday night......with the possibility of abit more Wednesday morning as the storm slows......could be a interesting first measureable snow. NWS upping the ante.......WINTER STORM WATCH just hoisted for the metro, calling for some 4-7 inches.....I guess their believing the NAM solution now. Usually by November, I'm good to go, but I was hoping for another couple of weeks of Fall before settling in for snow through the holidays. I'm still recovering from last April/May. The "hype" is coming early this year! I think a lot of people in the WS watch will be disappointed (or relieved) on how little white stuff they get by the end. The watch may verify, but only for a narrow narrow band. Of course, I could be way off and everyone will be digging out. The NAM Is really dialing up on the snow totals- It seems that each successive run is more aggressive with the snowfall than the first. It has been the leader in the trends with this system so far... I would not be surprised if it were to verify yet again. We'll see how things progress/change in the afternoon. I'm having a tough time buying into "Winter Storm Watch" criteria for this storm. I simply can't see how a widespread 6"+ snow falls over so. MN & western WI, esp. when considering the poor upper air dynamics. Their will definitely be a sharp baroclinic zone over the area & a quick 6-12 hour period of decent mid/upper level dynamics. This combination will be the driving force in creating a narrow band of accumulating snow. However, given the short duration of the event, I just can't imagine many locations getting 4"+ of snow. Gut feeling is that a 20 to 40 mi. wide snow band of 4"-7" will fall in so. MN, but not wide spread enough to issue a WSW. The biggest red flag is that there appears to be no solid deformation axis with this storm since the mid/upper level dynamics are not great. Complicating matters will be the sharp gradient in snow totals from NW to SE. Of course, we deal with this issue all the time. The National Weather Service office has downgraded the Winter Storm Watch to a Winter Weather Advisory, but has increased the snowfall totals. Are the interns working today? Its not really a downgrade. Its too close to the event to keep it as a watch. The WWA is used for a 3 to 7 inch snowfall. This clearly does not meet the requirements for a winter storm warning. "Tuesday Night: Snow, mainly before 4am. Low around 31. North wind 5 to 10 mph. Chance of precipitation is 100%. New snow accumulation of 2 to 4 inches possible." Then there's the advisory text, which calls for 3-5in, possibly 6. WTF is going on over there? "* SNOW ACCUMULATION: 3 TO 5 INCHES...WITH AMOUNTS AROUND 6 INCHES POSSIBLE." Then there's the Multimedia Weather Briefing (https://www.youtube.com/watch?v=IDyxU4yJm4g&list=PLGW0HMXgBbeD1Cu4a7jamnepIYd-mJxkt&index=1) which calls for the same, but the majority of the snow falling in the northwestern metro instead of the southeast. It appears the track is continually shifting south...too much NW dry air, I assume. I wouldn't be surprised if the west metro doesn't see much at all. Just set up a new thread to monitor tomorrow night's possible snow. I do want to point out as a NWS forecaster up in Grand Forks....for these early season events we are given quite a bit of latitude in regards to watches....esp if impacts will be high such as main snow falling during rush hour etc. Going from a watch to an advisory is not a downgrade. Plus you may not be aware but in Grand Forks forecast area we do winter storm watches/warnings for 4+ inches of snow in combination with 25 mph or higher winds....it is a special criteria that was approved when the office opened up in late 90s due to our flat terrain in the RRV any wind can cause severe issues. Thanks for the input, Dan. Always appreciate the perspective of the NWS forecasters on the blog. I think it can help bridge communication gaps that may exist. cabled weather stations types can be different but people shouldn't sacrifice the quality for having the most accurate and reliable results. So before spending specify things that you need.